A Manchester, New Hampshire student is now the target of extreme cyber harassment from around the world after she posted a fundraising page online to help pay a $250 parking ticket. A New Hampshire student is now the target of extreme cyber harassment from around the world after she posted a fundraising page online to help pay a $250 parking ticket. 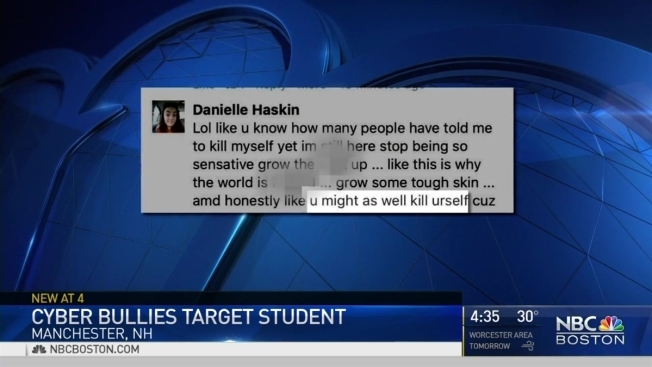 The 16-year-old Manchester girl is a junior at Memorial High School, but her mom tells NBC Boston she was too upset to go to school Friday because of the awful things people are saying about her online. Christine LaFrance says her daughter accidentally parked in a handicapped parking spot and was issued a ticket. She didn’t have the money and didn’t want to burden her mom, so the teen created a GoFundMe page, but never expected a barrage of hateful backlash. LaFrance spoke with NBC Boston over the phone requesting that we leave her daughter’s name out of it. Her daughter’s Facebook post about the fundraising effort attracted negative comments from Internet users around the world. People suggested everything from prostitution to suicide. Manchester Attorney Jim O’Shaughnessy prosecutes cyber harassment cases and isn’t surprised at how quickly such cruelty can rise to the surface. For LaFrance’s daughter, it’s proof that words are powerful, a life lesson learned the hard way. “She will persevere, she’s a strong young woman, I’ve raised her not to be any less than that,” LaFrance said. According to the GoFundMe Page, LaFrance’s daughter has raised more than enough money to pay her parking ticket.